Don’t miss our special offer – FREE license of E-mail Follow-Up is available! But creating tasks and setting reminders is a task in itself, too, and the amount of items on your schedule can become pretty overwhelming, especially when you deal with a large mail flow. 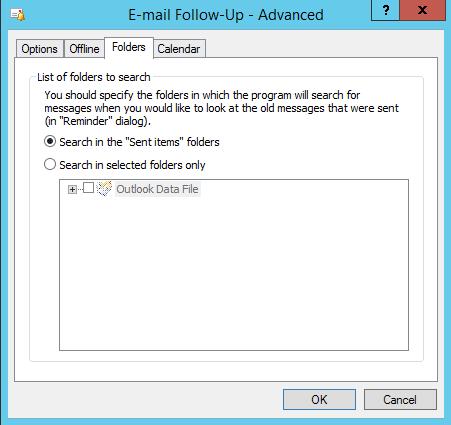 Instead, you can make use of an Outlook add-in by MAPILab called E-mail Follow-Up. This easy-to-use tool has two basic scenarios: it can either remind you to get in touch with your respondent if there is no reply within a specified time frame, or send an automatic reminder message to him. 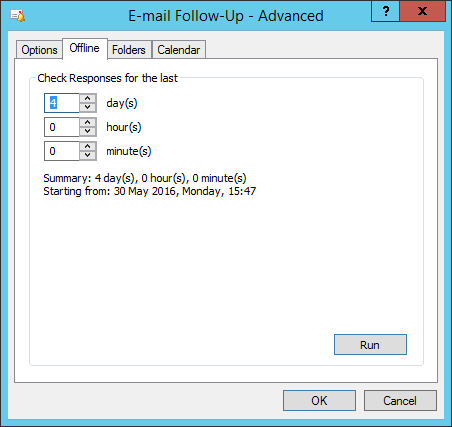 In this article we will take a look at the principal features of E-mail Follow-Up and show you how to set up reminders and edit templates. After you install the add-in, you’ll easily find it under MAPILab Tab on the Ribbon. If you click on Options, you will find some basic controls, such as removing appointments when reply is received and automatic time-frame adjustment, along with shortcuts to the list of appointments, templates, and advanced settings. First, if you plan on sending reminders to your recipients, you will probably need to come up with a universal and unimposing message that will gently push your recipient toward writing an immediate reply. To do that, click on Follow-Up Template, and go ahead. Remember to use placeholders (found under Macros) to help your respondent find the initial message. Here’s a nice custom-made template which is perfectly suitable for most occasions – feel free to use it! Besides, when the time comes to send the reminder, the add-in will prompt you of possible changes you’d like to make to the message, so don’t worry if the template cannot please everyone on your contact list. Second, let’s configure all the necessary settings in the Advanced section, which has four tabs. Under Options you can set days of the week on which you’d like reminders to be sent, for instance, you can exclude weekends. Offline Tab is responsible for searching the mailbox for unreplied messages that were sent within a specified time-frame. Under Folders you can choose which folders should be monitored by the tool (normally, Sent Items). Naturally, under Calendar, you specify the Outlook calendar where you would like appointments to be created, which is extremely handy if you need to share them with your colleagues. 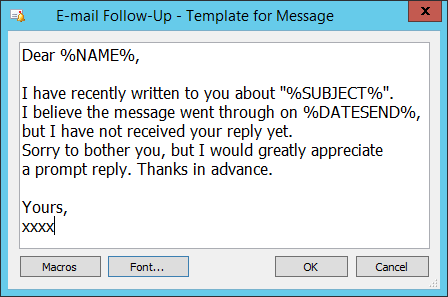 Third, let’s see how you can schedule an actual follow-up message based on our template for a new message. Open a new message window, choose MAPILab Tab on the Ribbon, and click on Custom to customize appointment options. Be careful not to click on Follow-Up, because this button both creates the appointment, AND sends the message immediately. After the letter has been sent, you can check the created appointment by looking it up in the list which can be found under View Appointments (in the dropdown menu from the Ribbon). Double-click on the appointment to view its properties. If there’s something you’d like to modify about the appointment, such as start time, check the Custom box and click Change. 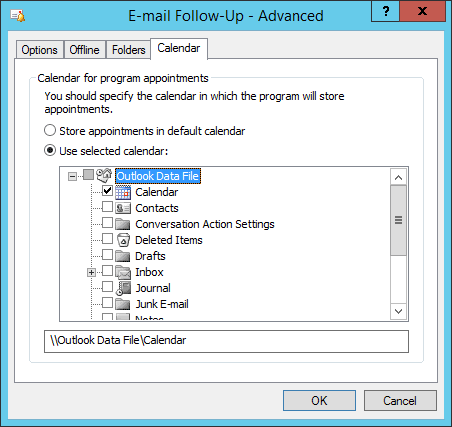 Alternatively, you can take a look at your regular Outlook calendar and find the reminder created by E-Mail Follow-Up. Thanks to the seamless integration of the MAPILab tool, this item can be edited just like any other Calendar appointment. We hope we’ve been able to give you a useful overview of how to boost the efficiency of your correspondence with the help of MAPILab E-Mail Follow-Up. We are happy to offer you an excellent opportunity to get E-mail Follow-Up for Outlook absolutely FREE OF CHARGE. The point is quite simple: you just need to visit stores provided by our partner, which is offering you a comprehensive range of actions (services testing, special offers in third-party stores, surveys, etc). Find and complete interesting offer from our partner and get a license for E-mail Follow-Up absolutely free of charge. How do we set up a follow up reminder for an email we already sent? I can’t seem to do that. 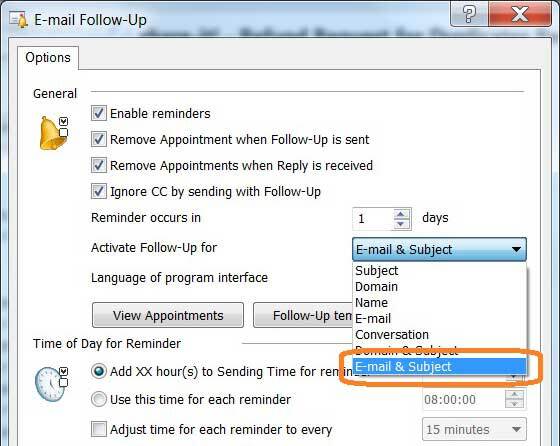 if you use “Follow-Up” to send messages, our add-in creates Calendar appointments – for every single message. Such appointment contains all data to look for reply to the original message. A workaround exists, but it is not very elegant: you can switch Outlook to “WorkOffline”, and forward (reply-to-all) your sent messages, then empty Outbox without sending. Appointments will be created, and the add-in will follow-up for replies. Please note: such appointments will work merely for recipient/sender and message subject (selected as criteria) – message ID of your forwarded messages will differ from the ones sent previously. Hi, I downloaded the free version of this and sent out some test emails. The follow up reminder pops up at the appropriate time, however the template response that wrote is not there, instead the reminder shows me a blank email. Hello Kayrene, thank you for your question. to the address line of Explorer (or Windows key+ R, or to the Search field in Start) and press Enter. Please check if that file with the name of your Outlook profile appears in that folder: if it does – please open it and try to edit (while Outlook is closed), then test. (We are finishing tests of the new version with extended logging – and can provide you the link to the RC version for better troubleshooting). I am testing Email followup it works fine until the outlook is open. 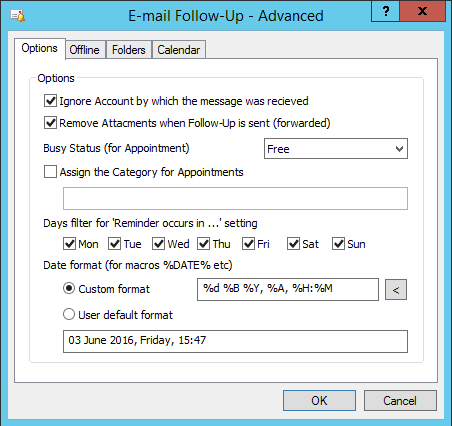 When my outlook is closed and if i receive an email on my Mobile or IPAD, on which i have applied email follow up action in Outlook. So when i read this email on mobile device and then i open my outlook, email follow up does not delete that appointment. Hello KJ, thank you for your question. 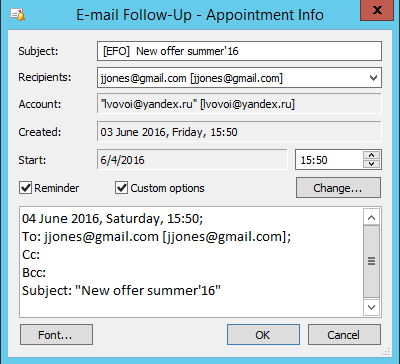 Our add-in can function and follow-up messages merely if and when they come into Outlook Inbox folder – in that case, the related appointment is either removed, or disabled (according to your add-in settings). We will think over the situation like yours for the next add-in version – thank you for your note ! Hi! I’ve just download the tril version to thest the plugin (version 1.11.1, no tril version for the newer one available). Need to test it in order to understand if we nee the plugn in our company. It seems like all is working fine except the tempate. When using “Send Follow-Up” option on reminder the plugin ads a signature in the body instead of the template. So basically there are 2 signatures in the email instead of a signature and a template. We are using Office 365, outlook version is the latest. Please advice how to fix the behaviour. Hello Dmitry, thank you for your question. We will also need to know your Office version and bitness, and the types of your Outlook accounts. if yes, why cant i find you in the official Microsoft store? Hello Nick, thank you for your question. Our add-in is fully compatible with the desktop Microsoft Office components, including Office 365. All our add-ins require installation on a physical machine where Microsoft Office desktop version is installed on local unit as well (in %Program Files% and in the registry). Add-in functionality is provided by adding local DLLs to Outlook and Word/Publisher local installations. It will not work with the “Office Online” (cloud) version – and that is actually the cause why our add-ins are not added to Microsoft AppSource. Is there a way to send at least a personalzed mass mail with the follow up mode triggered? Or is there a way to force the follow up mode on all outgoing mail? Hello Nicolas, thank you for your question. 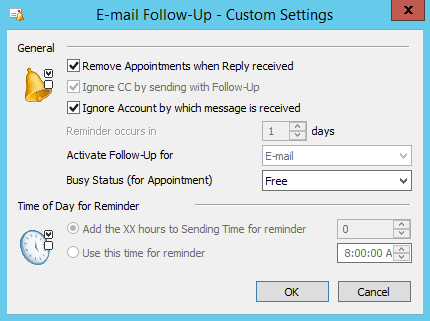 Applying the E-Mail Follow-Up settings to the messages sent with the Send Personally add-in, for the same messages within the same mailing, is unfortunately impossible. 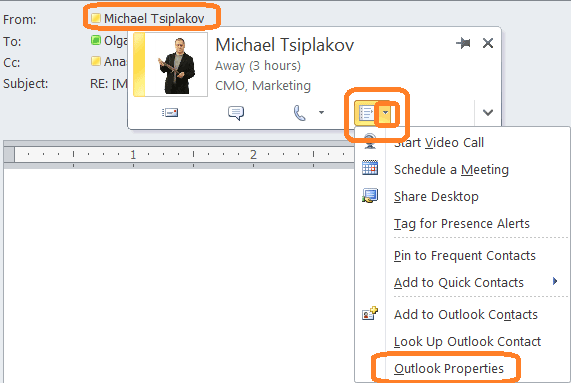 You can disable immediate sending messages in Outlook (or, switch to “work offline”), let Send Personally generate all your individual messages and place them to Outbox – then, open every single message in turn from Outbox and press the “Email Follow-Up” button to send them with this option from Outbox. This method will work, but will take you some more time. The add on doesn’t seem to identify a response from the same email address when it contains caps characters. Hello Kurt, thank you for your question. The Email Follow-Up add-in monitors message by E-mail (if you select exactly this criterion) without sensitivity to alphabetic case. Actually, all our software behavior this way with e-mail addresses, according to the international production standard (RFC 822 IS: http://www.ietf.org/rfc/rfc0822.txt) which we use as well. Is there a reason my question was removed and not answered? How do I make sure the reminder is just for me and not for the recipient. Hello Mark, thank you for your question. Sorry for the absence of your comment – we experienced and fixed an issue with the website recently. The add-in does not send reminder anywhere – it sends merely e-mail message. 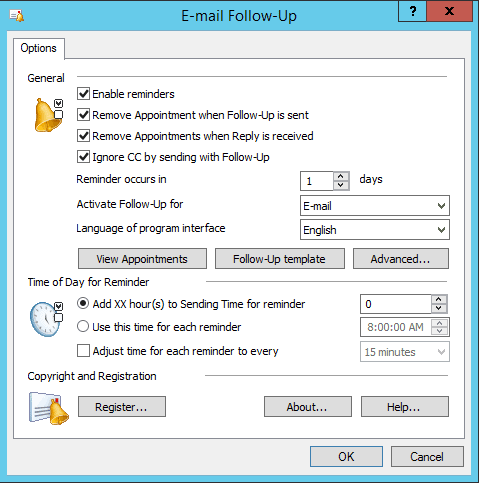 Outlook displays the notification for the sender only: E-Mail Follow-Up creates an appointment in Outlook Calendar once the message is sent (no message properties are changed in this process). 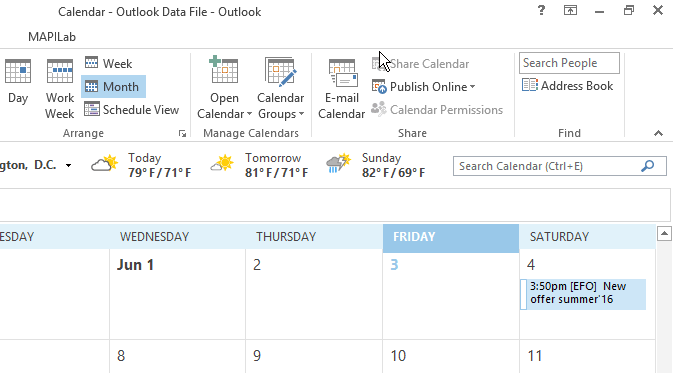 And later sender’s Outlook reacts to that Calendar item with the reminder. If you wish to remind your message recipient as well – you can send a follow-up message, the add-in may offer you that action if you wish. I have been testing your product and it only sends an email reminder to ME (i.e. my email address). I dont need a reminder, i need to send the reminder to the original recipient of the email. Please advise. Hello Jay, thank you for your question. I replied your request in our trouble ticket system – I believe, there is an option to be corrected in your add-in settings, but will need to see thenm in order to advise. Please send us your screenshots in your trouble ticket. Thank you ! What happens when I send several messages with different subjects to the same recipient? If I place reminders for all the messages, will they be deleted once the recipient replies to one of the massages? I do not want this to happen, as the message are for different topics. Is this possible? Hello Mar, thank you for your question. Unfortunately, there is no such method. The only template is available in the program settings. 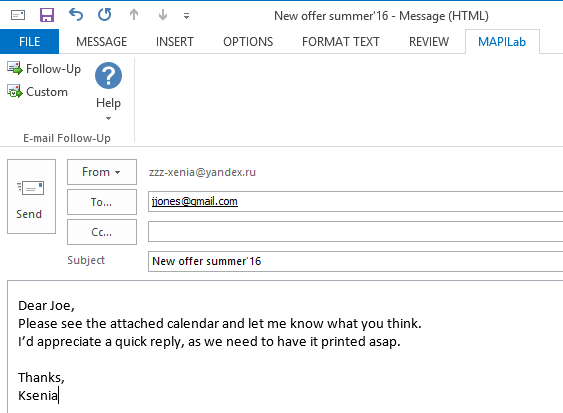 Is there a method to have multiple templates used for automatic e-mail responses?